​Gema García Grijalva is Adjunct Instructor of Piano/Accompanist and I am Instructor of Clarinet at USD, and early in the 2018 Fall semester we formed Duo Lebhaft, playing music for clarinet and piano. Duo Lebhaft has been a joyful project and we are excited to share with you the very first performance. In the future, we plan to continue to perform more concerts and collaborate with chamber musicians around San Diego and beyond. For our first concert, we chose repertoire that is familiar to us both, and that I taught this semster to my students- masterworks for clarinet and piano, plus a Bach treat arranged by a master pedagogue, Stanley Hasty. BRAHMS: Sonata in F minor, Op. 120 No. 1. Do you think that clarinet is just for marching band or concert band or orchestra? No way! Check out some of my friends who are crushing it on YouTube with their crossover group, FourPlay Clarinet. They make music videos and arrange popular music for clarinet with a techno/dance music beat. I dare you to sit still while you listen to them. The reality of being a musician in the twenty-first century, more than ever, means that we make our own path; we are called to be entrepreneurs. Sometimes we learn the skills required along the way. 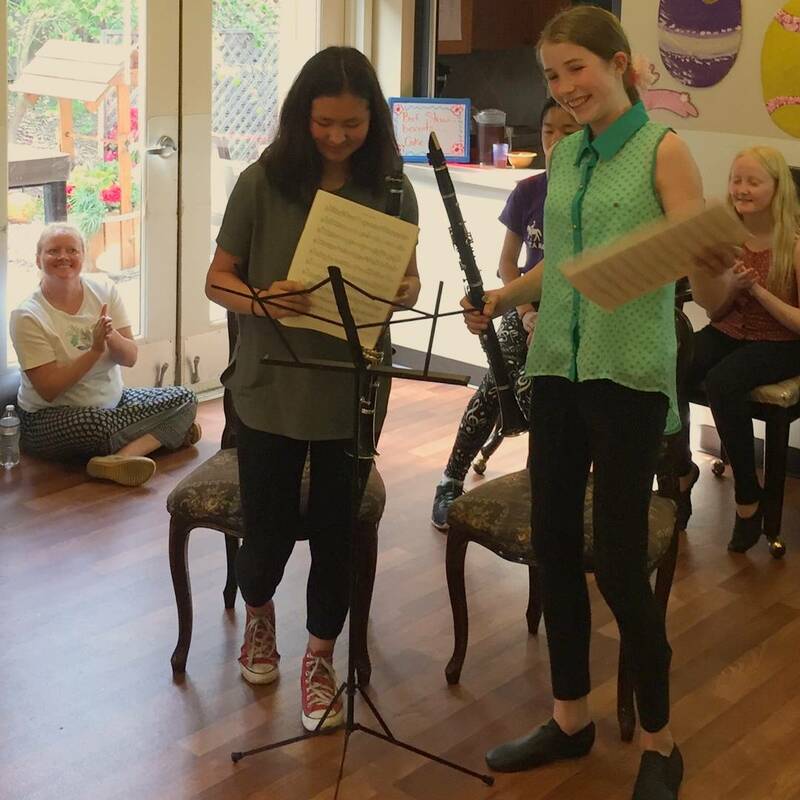 Gallagher Clarinet Studio students and friends Nicole Park and Elizabeth Hazard for their recent performance at Olivenhain Guest Home for Alzheimer's care in Encinitas. They gave an interactive, multidisciplinary performance. Elizabeth said that the most memorable part was that "when we played 'Edelweiss', all the seniors started singing along. It was really great." It is a priority of the Gallagher Music Studio to give performances such as these, modeled on the Gluck Fellowship, and to produce musicians who are compassionate and thoughtful leaders in their fields for the rest of their lives, no matter what they pursue as careers. 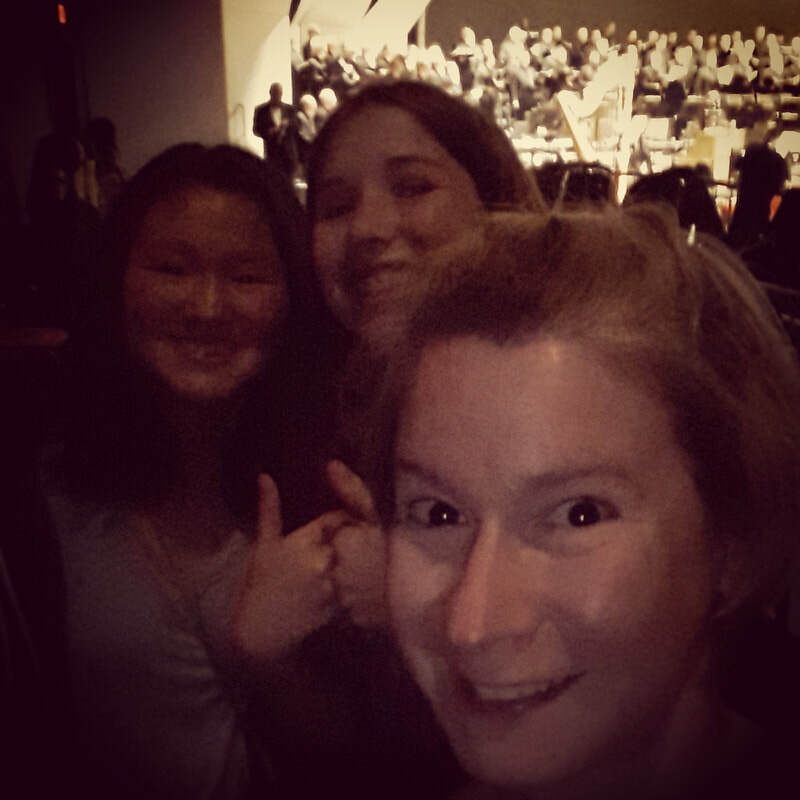 Students Nicole Park and Elizabeth Hazard came to listen to me rehearse with the La Jolla Symphony last night. I am substitute principal clarinet for their upcoming concert. It was a good chance for them to see an example of an orchestra rehearsing, as well as to be exposed to a higher level of musicmaking. It was also fun to be able to perform for my students in a run-through of Liszt Les Preludes! Congratulations to Matthew Crane, who will be playing in the 2018 California All-State Festival! Congratulations to Nicole Park who placed in the 2018 San Diego All-County District Festival. Congratulations to Matthew Crane, who will be playing E-flat clarinet in the California All-Southern Festival. Congratulations to Alexander Parlee, who won the Grand Prize (and $1,000USD!!) in the 2017 San Diego Clarinet Society Young Artists' Competition. He gave a thrilling, musical performance of Cavallini's Introduction and Tarantella and advanced through three rounds to come out on top! Congratulations to Alexander Parlee, who was accepted into the Interlochen Center for the Arts Summer Camp, as well as accepted as an alternate to Boston University Tanglewood Institute. Congratulations to Nicole Park, who will be playing First Chair clarinet at the CMEA-SBS All-County Middle School Honor Band! Congratulations to MiraCosta College student Gerardo Reyes, who will be attending California State University-Fullerton School of Music in 2017! He received a Music Department Performance Scholarship. Congratulations to Joseph Mumper, who will be attending Biola University in 2017 as a Composition Major. He received a full ride based on his clarinet audition and composition portfolio interview! He completed his audition on my vintage Buffet R13- it was very happy to be in the hands of a player again. If you studied with Alice Gallagher, please fill out the contact form and let us know about your current occupations and endeavors! D'Lainey Forrester (MUSIC, UCLA) is currently a musician for Kyodo Tokyo, Inc. in Japan. She has also served as the visual instructor at Santa Monica High School.